Dolphins are adorable and brainy creatures! The fact that a marine animal can be trained to do fun activities is a wonder. Who wouldn't get excited to see such amazing creatures in their natural habitat? Yes, that is why dolphin spotting is a rejuvenating activity, and it is popular in India. Did you know that River Dolphin is the National Aquatic Animal of India? You can spot river dolphins in the Ganges and Brahmaputra rivers in India. Other than that, the sea dolphins draw a lot of crowds to some coastal areas. 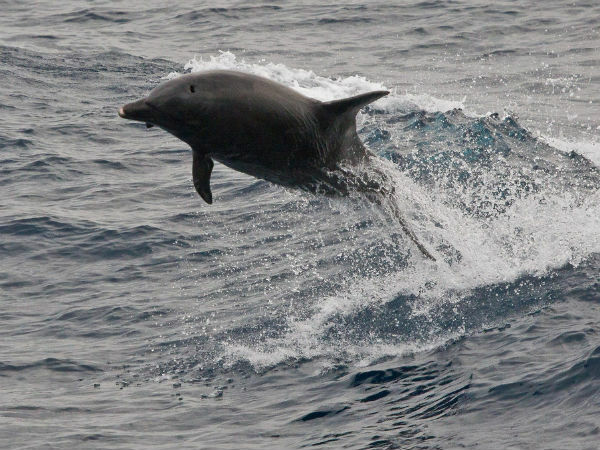 So, are you excited about dolphin spotting? Have a look at these best dolphin destinations in India. Dolphin spotting is the most exciting activity in Goa. Tourists love to go on Dolphin boats and enjoy it to the fullest. There are many beaches and rivers where dolphins are spotted in Goa. Calangute Beach is one of the best beaches to enjoy Dolphin cruises. Firstly, boating in the beach itself is a recreational activity and to top it all dolphins jumping around is like 'icing on the cake'. Sinquerim Beach, Mandovi River, Candolim Beach, etc. are other destinations where you can spot dolphins. Maharashtra's coastline provides a lot for tourism. In fact, the unexplored seaside of the state has a lot of surprises for the visitors. Not forgetting the pristine vistas and water adventure sports, some beaches are a home to dolphins too. Tarkarli Beach is one of the places where you can spot dolphins in Maharashtra. Tarkarli is an offbeat beach destination in Sindhudurg; the backwaters and the seaside here are just amazing to explore. Hence, it is one of the best dolphin destinations in India. It is not wrong to say that Chillika Lake the world within; its vast horizons keep enchanting all! Apart from numerous birds, it is a home to Irrawaddy river dolphins. Boating in this brackish lagoon is excellent fun and spotting dolphins is even more exciting. Ganga river flows for a stretch of 50km from Sultanganj to Kahalgaon in Bihar. Observing the concentration of Gangetic river dolphins in this region, Vikramashila Dolphin Gangetic Sanctuary was set up in Bhagalpur. Interestingly, it is the only protected areas of the Gangetic river dolphins in Asia. So head to this dolphin sanctuary from October to June and enjoy looking at happy Soons (local name for river dolphins). North Button Island National Park is an unexplored destination in Andaman and Nicobar Islands. It is known for several marine animal species and worth a visit for its unique features. North Button Island National Park is famous for dolphins and dugong. The mystic Lakshadweep is known for its white sand beaches and greenish-blue waters. It has several beaches and unexplored islands that remain a mystery. Agatti Island is one of the top tourist places in Lakshadweep. Special thing awaits for those who visit here, yeah it is the dolphins. Agatti Island is one of the best dolphin destinations in Lakshadweep, India.